Hanukkah, the Jewish Festival of Lights, starts the night of Sunday, Dec. 2 this year. This holiday is quite well-known because of its proximity to Christmas, but how much do you really know about it? We thought we would answer a few of the most frequently asked questions about Hanukkah (or Chanukah or Hanukah or Chanuka) here. Hanukkah may be one of the most well-known Jewish holidays, but it is hardly the most religiously significant. Hanukkah celebrates the aftermath of a military victory by Jews (the Maccabees) who fought the religious oppression of Assyrian rule more than 2200 years ago. The Jews took back the holy Temple in Jerusalem, which had been desecrated by the Assyrians, who had used it to worship idols and allowed farm animals to reside there. Hanukkah celebrates a miracle — when the Maccabees wanted to light the menorah as part of the re-dedication, they could only find a tiny flask of oil, enough to light it for only one day. As the story goes, a miracle happened when the oil actually lasted for 8 days. (Think of it this way: it would be as if your phone was on 10 percent and you had no charger, but it stayed on for eight days!) While the message of Hanukkah is a beautiful one – one that celebrates faith, miracles, and dedication to our people and our traditions — the story is not found in Jewish scripture. Work doesn’t stop on Hanukkah, nor do other regular activities. I’ve been asked several times if I am going “home” for Hanukkah (ie to be with family). We typically go “home” for the “major” holidays such as Rosh Hashanah and Passover. This year my extended family will celebrate Hanukkah together when it’s convenient, and probably we will do some candle lighting blessings via over FaceTime; we are grateful to have plenty of local friends with whom we will share the holiday. Unlike other Jewish holidays, work doesn’t stop for Hanukkah, and we don’t have lengthy services at synagogue. The main religious observance is lighting candles on the Hanukkah menorah each night, generally in the home or wherever one might be. A Hanukkah menorah has nine branches – one for each night, as well as a “helper” candle called the shamash that lights the other candles. Yes, some people give gifts on Hanukkah, but there is no one way to do it. Presents were not part of the Hanukkah tradition until very recently, and mostly it is an American construct. Probably the biggest myth about Hanukkah is that everyone gets eight presents – one every night. Every family has its own Hanukkah gift-giving traditions. When I was growing up, I got a gift just about every night, but they weren’t all from my parents – one night the gift would be from a sibling, the next an aunt and uncle, etc. Some families do not give gifts at all – traditionally, children receive money for Hanukkah, called “gelt.” Nowadays gelt is also given in the form of chocolate coins. Gift-giving is usually centered around children. The dates we celebrate Hanukkah never change. Yep, it’s true — Hanukkah always starts on the 25th of the Hebrew month of Kislev, but because the Hebrew calendar is based on a lunar calendar, the “English” date changes every year. Sometimes Chanukah isn’t even in December (think “Thanksgivukkah” a few years ago). There is not one “true” English spelling of the holiday’s name. The name is a Hebrew word, meaning dedication, that has been transliterated into English. 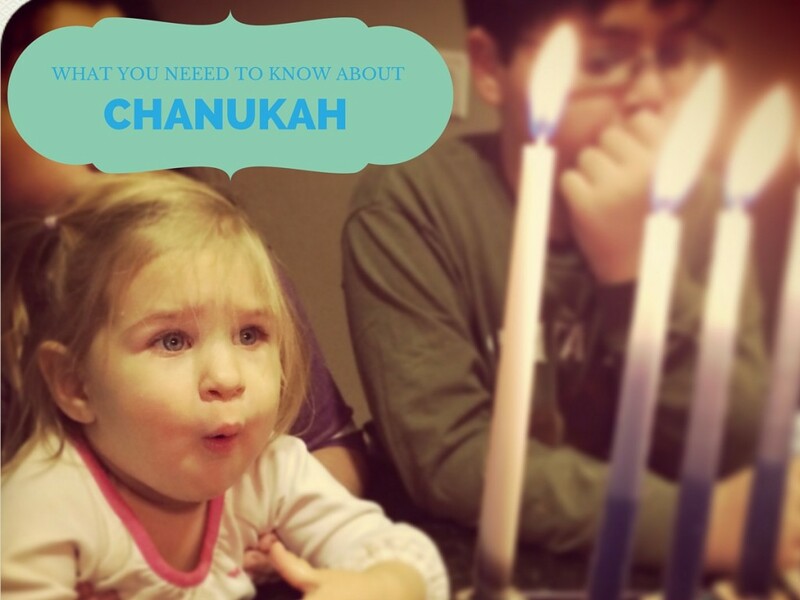 That’s why you’ll see the various spellings – Chanukah/Hanukkah/Hanukah/Chanuka/Hanukka. It is Associated Press newspaper style to spell it “Hanukkah,” which often is seen in the press; I prefer “Chanukah”. In Hebrew, there’s only ONE way to spell it! In Hebrew, there’s only one way to spell the name of the Jewish Festival of Lights: Chet, Nun, Vav, Kaf, Hay. We get to eat foods fried in oil on Hanukkah — and they have zero calories. So I made that last part up, but part of celebrating Chanukah customarily means eating latkes and other foods fried in oil, to remind us of the miracle of the oil lasting eight days. And let me just say that latkes are not potato pancakes — they’re much better! Jelly donuts (called sufganiyot) are very popular in Israel; my daughter is convinced that we just need to eat French fries and we’re good.